Lovely ceramic mug from Jerusalem, Palestine. 4" tall. 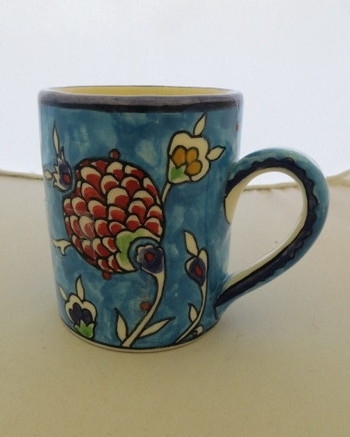 Jerusalem pottery is all individually hand painted and fired in the studios and kilns of the Karakashian family, following a family tradition since 1922, when Megerditch Karakashian came to Jerusalem to help renovate the Dome of the Rock. All the motifs are traditional designs - birds, peacocks, gazelles, fish and various floral patterns. Each piece is hand painted with a hand made brush. First, the black is painted on to give the design its outline, and then the colors are filled in. After the wares are colored, they are hand dipped in a clear glaze and fired.